I have lordosis which is an over-exaggerated curve in the lumbar spine. My first memories of this were as a teenager when my back would periodically go into spasm. As a child until my mid twenties I danced and I was forever being told not too stick my bum out which is visually what lordosis looks like – your bum sticks out and so does your belly. I have always found flexion (bending) my spine tricky however extending (arching/back-bending) very easy. Pilates initially made me more body aware. I danced semi-professionally so I have always been body aware but Pilates takes it to another level. I started to learn and understand where my movements were restricted and what I needed to activate or deactivate to get parts to move or not to move in certain positions/directions. Through Pilates I have learnt to engage my deep abdominals – ever been told to pull in your stomach but not taught how? This was all of my dance career! I am able to pick my pelvis up so I do not over arch my back and I have leant the tools to lengthen my lumbar spine and to flex my spine. Cue getting older, having whiplash, having pelvic girdle pain when pregnant, running an ultra marathon, having the odd injury here and there, sitting for too long, sleeping awkwardly etc.. etc..
Pilates always brings me back to normal… without fail. 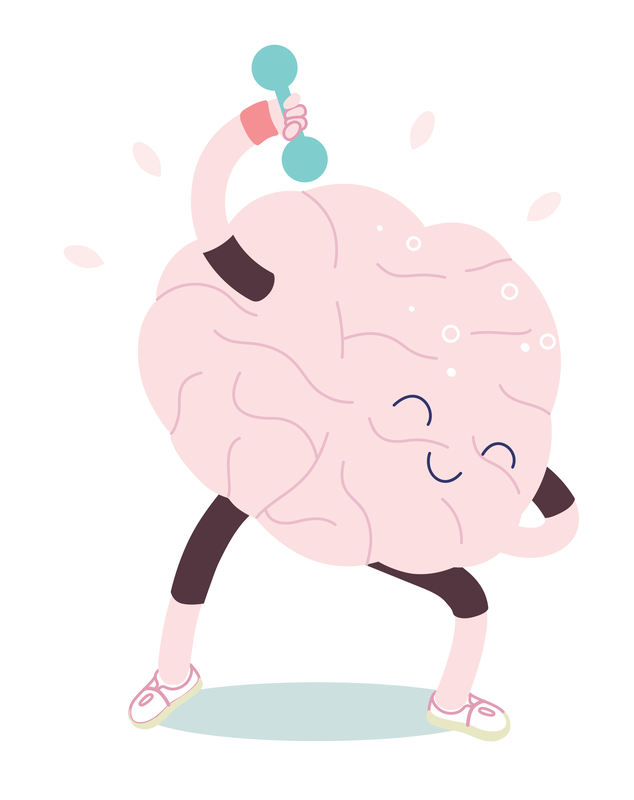 How Exercise Reprograms The Brain. In the late 1990s, then-postdoc Henriette van Praagand other members of Rusty Gage’s lab at the Salk Institute for Biological Studies in La Jolla, California, were fascinated with recent findings from the group showing that mice whose cages had toys and running wheels developed more new neurons in the hippocampus, a brain area important for learning and memory, than mice living in less-stimulating enclosures. 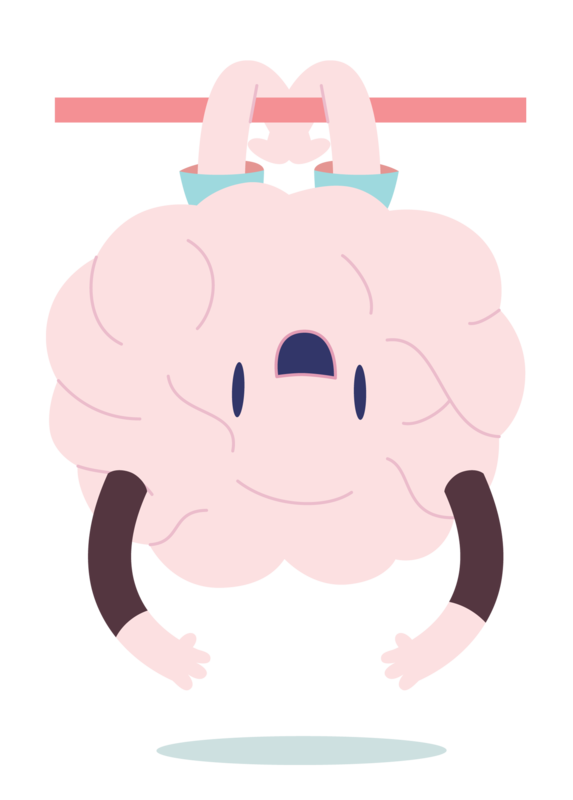 Exercise’s EffectsPhysical activity increases the volume of the brain’s hippocampus and improves learning and memory in mice and humans. Mouse studies have linked these effects to the growth and maturation of new neurons. Now, researchers are beginning to unravel the molecular mechanisms that connect exercise to these cognitive benefits.See full infographic: WEB | PDF© JULIA MOORE, WWW.MOOREILLUSTRATIONS.COM1. BRAIN-DERIVED NEUROTROPHIC FACTORExercise influences levels of neurotrophins, proteins that promote the proliferation of neurons and support their function. Physical activity enhances DNA demethylation in the promoter region of the Bdnf gene, increasing the expression of the neurogenesis-boosting signaling factor. Moreover, histone acetylation appears to loosen chromatin to bolster Bdnf transcription. 2. BLOOD SIGNALSExercise leads to the secretion of molecules by muscle and fat cells that affect levels of growth factors in the brain, influencing the shape and function of the hippocampus by accelerating new neuron growth and increasing the volume of the brain region. 3. SPERMIn the sperm of male mice that exercise, the abundance of certain microRNAs associated with learning and memory increases. The mice’s offspring show slight cognitive advantages compared with offspring of sedentary mice. Scientists have long assumed that the exercise-induced changes to offspring are epigenetic in nature, and recent research is beginning to support that hypothesis. One group reported in 2015 that three months of physical exercise changed the DNA methylation patterns of young men’s sperm. The tweaks occurred at genes associated with schizophrenia, Parkinson’s disease, and other brain disorders (Epigenomics, doi: 10.2217/epi.15.29).See “Ghosts in the Genome”To further investigate exercise-induced changes in gene expression, Anthony Hannan of the Florey Institute of Neuroscience and Mental Health in Victoria, Australia, and colleagues studied the sperm of mice that ran on wheels or performed other physical activities. The team showed that exercise spurred changes in the expression levels of several small RNAs in the germline cells of male mice. It is known that small RNAs packaged into gametes can influence the metabolism of offspring, and possibly also learning and memory. Male mice born to fathers with these changes in their sperm had reduced anxiety levels, leading the authors to conclude that parental exercise can exert a transgenerational effect on offspring’s emotional health (Transl Psychiat, 7:e1114, 2017). H. van Praag et al., “Running enhances neurogenesis, learning, and long-term potentiation in mice,”PNAS, 96:13427–31, 1999. How Muscles Age and How Exercise Can Slow It. To you readers over age 30, we’ve got some bad news for you. Chances are good you’ve already begun losing muscle. And it only gets worse. Up to a quarter of adults over the age of 60 and half of those over 80 have thinner arms and legs than they did in their youth. In 1988, Tufts University’s Irwin Rosenberg coined the term “sarcopenia” from Greek roots to describe this age-related lack (penia) of flesh (sarx). Muscle aging likely has several underlying factors, including decreased numbers of muscle stem cells, mitochondrial dysfunction, a decline in protein quality and turnover, and hormonal deregulation. Loss of muscle mass is associated with—and possibly preceded by—muscle weakness, which can make carrying out daily activities, such as climbing stairs or even getting up from a chair, difficult for many seniors. This can lead to inactivity, which itself leads to muscle loss at any age. Thus, older people can enter a vicious cycle that will eventually lead to an increased risk of falls, a loss of independence, and even premature death. The good news is that exercise can stave off and even reverse muscle loss and weakness. Recent research has demonstrated that physical activity can promote mitochondrial health, increase protein turnover, and restore levels of signaling molecules involved in muscle function. But while scientists know a lot about what goes wrong in aging, and know that exercise can slow the inevitable, the details of this relationship are just starting to come into focus. Skeletal muscle consists of multinucleated fibers formed by the fusion of muscle precursor cells, or myoblasts, during embryonic and fetal development and postnatally until the tissue reaches its adult size. Mature fibers are post-mitotic, meaning they do not divide anymore. As a result, in adulthood both muscle growth and repair are made possible only by the presence of muscle stem cells. In 1961, Rockefeller University biophysicist Alexander Mauro, using electron microscopy, first described muscle stem cells, calling them “satellite cells” because of their position at the periphery of the muscle fiber.1Subsequently, researchers have demonstrated that satellite cells are the only cells able to repair muscle—which explains why recovery from muscle injuries among the elderly is slow and often incomplete: the number of satellite cells falls from 8 percent of total muscle nuclei in young adults to just 0.8 percent after about 70 to 75 years of age. Other likely culprits of muscle aging are the mitochondria, the powerhouses of muscle. To work efficiently, skeletal muscle needs a sufficient number of fully functional mitochondria. These organelles represent around 5 percent to 12 percent of the volume of human muscle fibers, depending on activity and muscle specialization (fast-twitch versus slow-twitch). And research suggests that abnormalities in mitochondrial morphology, number, and function are closely related to the loss of muscle mass observed in the elderly. In 2013, David Glass of Novartis and colleagues found that markers of mitochondrial metabolism pathways were significantly downregulated as rats aged, and this correlated with the onset of sarcopenia.5 Although the findings are merely correlative, the timing and near-perfect relationship between decline in mitochondrial gene expression and the onset of sarcopenia provides strong evidence that mitochondrial dysfunction may be driving sarcopenia. The expression of genes and production of proteins that regulate mitochondrial fission and fusion—processes that maintain mitochondrial volume and function—also dropped, suggesting that mitochondrial dynamics are also perturbed during muscle aging. Even if they eat plenty of protein, older people often cannot maintain muscle mass, probably because their bodies cannot turn proteins into muscle fast enough to keep up with the natural rate of the tissue’s breakdown. Moreover, the muscles of older people undergo lower levels of autophagy, a process that under healthy conditions recycles used and damaged proteins, organelles, and other cell structures. This can result in an imbalance between protein production and degradation that is likely linked to muscle aging. In 2005, Stanford University stem cell biologist Thomas Rando and colleagues combined the circulation of young and old mice and found that factors in the blood of young mice were able to rejuvenate muscle repairin aged mice. It is now well known that the levels of circulating hormones and growth factors drastically decrease with age and that this has an effect on muscle aging. Indeed, hormone replacement therapy can efficiently reverse muscle aging, in part by activating pathways involved in protein synthesis. Moreover, the muscle itself is a secretory endocrine organ. Proteins produced by the muscle when it contracts flow into the blood, either on their own or encased in membrane-bound vesicles that protect them from degradation by circulating enzymes. Bente Pedersen of the Centre of Inflammation and Metabolism and Centre for Physical Activity Research in Denmark was the first to use the term myokine to describe these proteins. Secreted myokines can act locally on muscle cells or other types of cells such as fibroblasts and inflammatory cells to coordinate muscle physiology and repair, or they can have effects in distant organs, such as the brain. Although several of these myokines have been identified—in culture, human muscle fibers secrete up to 965 different proteins—researchers have only just begun to understand their role in muscle aging. The first myokine to be identified, interleukin-6 (IL-6), participates in muscle maintenance by decreasing levels of inflammatory cytokines in the muscle environment, while increasing insulin-stimulated glucose uptake and fatty-acid oxidation. Elderly people with high circulating levels of IL-6 are more prone to sarcopenia. Another myokine, insulin-like growth factor 1 (IGF-1), can trigger the swelling of muscle fibers, including after exercise. IGF-1 levels decrease with age, as do levels of the cell-surface receptor that IGF-1 binds to, and mice that overexpress IGF-1 are resistant to age-related sarcopenia. Nathalie Viguerie and colleagues from the Institute of Metabolic and Cardiovascular Diseases at INSERM-Toulouse University in France recently discovered a novel myokine, which they termed apelin.8 The researchers have demonstrated that this peptide can correct many of the pathways that are deregulated in aging muscle. When injected into old mice, apelin boosted the formation of new mitochondria, stimulated protein synthesis, autophagy, and other key metabolic pathways, and enhanced the regenerative capacity of aging muscle by increasing the number and function of satellite cells. As with IGF-1, levels of circulating apelin declined during aging in humans, suggesting that restoring apelin levels to those measured in young adults may ameliorate sarcopenia. Exercise’s influence on muscle health likely acts through as many mechanisms as those underlying age-related muscle loss and weakness. For example, the number of satellite cells can be increased by exercise, and active elderly people have more of these cells than more-sedentary individuals do. This is the reason why exercise prior to hip and knee surgery can speed up recovery in the elderly. Sarcopenia is part of the general process of aging, but it can be triggered prematurely in some late-onset muscle diseases. For example, oculopharyngeal muscular dystrophy (OPMD) is a rare genetic disease that primarily affects the eyelid (oculo) and throat (pharyngeal) muscles. Mutations in the polyadenylate binding protein nuclear 1 (PABPN1) gene lead to the production of an abnormal protein that forms aggregates only in nuclei of muscle fibers. The late onset of the disease, which generally appears between 50 and 60 years of age, suggests that the affected muscles successfully cope with the abnormal protein for many years. However, the ability to deal with abnormal proteins decreases with age, and an imbalance between elimination and aggregation could trigger the onset of OPMD. OPMD shows mechanistic similarities with severe degenerative disorders in which perturbed RNA metabolism and pathological assemblies of RNA-binding proteins are involved in the formation of cytoplasmic or nuclear aggregates. In patients with spinocerebellar ataxias, ALS, Alzheimer’s, Huntington’s, or Parkinson’s diseases, these aggregates form in the neurons. In the case of myotonic dystrophy and inclusion body myositis, they form in the muscle fibers. Defining the exact alteration in RNA metabolism is an interesting question facing researchers studying muscle aging. Of note, all of these diseases are also characterized by abnormal mitochondria, which are observed in aging muscle. Research into these diseases should not only lead to specific treatments, but also to interventions for the generally healthy aging population. And the reverse is also true: understanding how to stall muscle aging may provide tools to ameliorate pathological conditions. Therefore, cooperation between the pathophysiology and aging fields to study these diseases, for which animal and cellular models exist, should be a focus of future research. Exercise can even spur muscle cells to maintain more-youthful levels of gene transcripts and proteins. For example, Sreekumaran Nair from the Mayo Clinic in Rochester, Minnesota, and colleagues found that high-intensity aerobic interval training reversed many age-related differences in muscle composition, including restoring mitochondrial protein levels.11 And Simon Melov at the Buck Institute for Research on Aging and Mark Tarnopolsky of McMaster University in Canada and their colleagues have found that while healthy older adults (average age 70) had a gene-expression profile that was consistent with mitochondrial dysfunction prior to a resistance exercise training program, in just six months this genetic fingerprint had completely reversed to expression levels comparable to those observed in young subjects. Additionally, exercise improved muscle function: the older adults were 59 percent weaker than the younger adults before training, and only 38 percent weaker afterward.12 Different types of exercise can trigger variable but specific responses in the muscle. For example, whereas strength training is efficient at making muscle, high intensity interval training in aerobic exercises such as biking and walking had the greatest effect at the cellular level at combating age-related loss and weakness, according to Nair’s work. Exercise may prevent or reverse many of these age-related changes, whereas inactivity will accelerate muscle aging. By these mechanisms and others we have yet to discover, exercise can improve overall strength in the elderly, and specifically, the metabolic vigor of skeletal muscle. Being the most abundant tissue in the average human body, accounting for 30 percent to 40 percent of its total mass, muscle is not only critical for locomotion and breathing, but also for glucose, lipid, and amino-acid homeostasis. The age-associated loss of muscle mass and quality thus contributes to the general metabolic dysfunction commonly seen in elderly patients. In older women, one hour of brisk walking produced elevated insulin sensitivity on the following day.17 Therefore, it is never too late to exercise to try to combat the consequences of muscle aging. 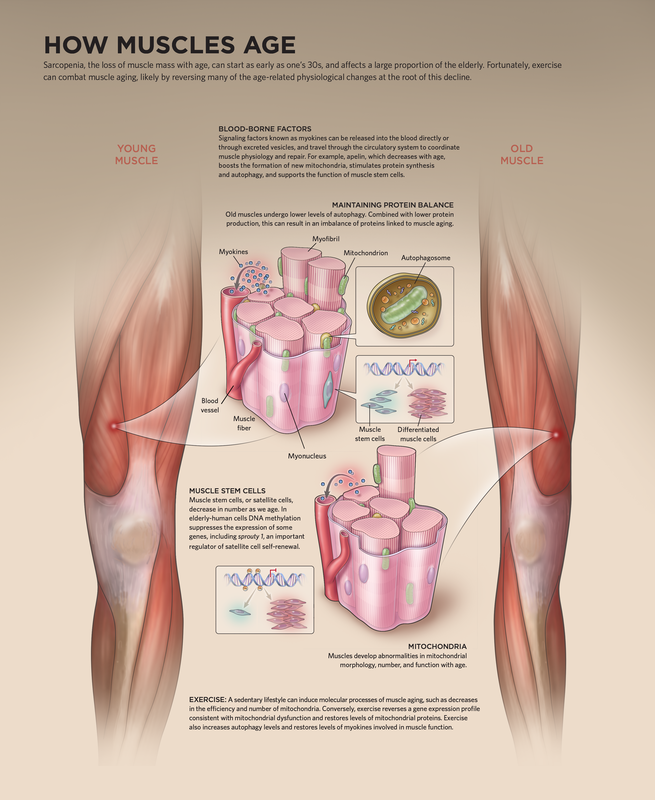 A detailed understanding of the molecular and cellular pathways involved in muscle aging could pave the way for the development of therapeutic interventions to boost protein synthesis and increase muscle mass. For now, regular exercise combined with good nutrition is still the most effective way to fight sarcopenia, and possibly aging overall. In addition to detailing the underlying causes of muscle aging, future research should seek to define optimal physical exercise and nutritional programs to combat age-related muscle loss and weakness. It may not significantly increase human lifespan, but it will certainly help people reach the end of their lifespan in a healthier condition. Gillian Butler-Browne studies neuromuscular diseases and gene therapy at Sorbonne Université, INSERM, Institut de Myologie, Centre de Recherche en Myologie, in Paris, France. At the same institution, Vincent Mouly studies muscle regeneration in health and disease, Anne Bigot studies muscle aging, and Capucine Trollet studies age-related muscle disease and gene therapy. A. Mauro, “Satellite cell of skeletal muscle fibers,” J Biophys Biochem Cytol, 9:493–95, 1961. B.M. Carlson, J.A. Faulkner, “Muscle transplantation between young and old rats: Age of host determines recovery,” Am J Physiol, 256:C1262–66, 1989. A. Bigot et al., “Age-associated methylation suppresses SPRY1, leading to a failure of re-quiescence and loss of the reserve stem cell pool in elderly muscle,” Cell Rep, 13:1172–82, 2015. W. Liu et al., “Loss of adult skeletal muscle stem cells drives age-related neuromuscular junction degeneration,” eLife, 6:e26464, 2017. C. Ibebunjo et al., “Genomic and proteomic profiling reveals reduced mitochondrial function and disruption of the neuromuscular junction driving rat sarcopenia,” Mol Cell Biol, 33:194–212, 2013. A. Pannérec et al., “A robust neuromuscular system protects rat and human skeletal muscle from sarcopenia,” Aging, 8:712–28, 2016. E. Masiero et al., “Autophagy is required to maintain muscle mass,” Cell Metab, 10:507–15, 2009. A. Besse-Patin et al., “Effect of endurance training on skeletal muscle myokine expression in obese men: identification of apelin as a novel myokine,” Int J Obes, 38:707–13, 2014. N.A. Duggal et al., “Major features of immunesenescence, including reduced thymic output, are ameliorated by high levels of physical activity in adulthood,” Aging Cell, 17:e12750, 2018. C. Tezze et al., “Age-associated loss of OPA1 in muscle impacts muscle mass, metabolic homeostasis, systemic inflammation, and epithelial senescence,” Cell Metab, 25:1374–89.e6, 2017. R. Sreekumar et al., “Gene expression profile in skeletal muscle of type 2 diabetes and the effect of insulin treatment,” Diabetes, 51:1913–20, 2002. S. Melov et al., “Resistance exercise reverses aging in human skeletal muscle,” PLOS ONE, 2:e465, 2007. F. Lo Verso et al., “Autophagy is not required to sustain exercise and PRKAA1/AMPK activity but is important to prevent mitochondrial damage during physical activity,” Autophagy, 10:1883–94, 2014. C. He et al., “Exercise-induced BCL2-regulated autophagy is required for muscle glucose homeostasis,” Nature, 481:511–15, 2012. C. Vinel et al., “The exerkine apelin reverses age-associated sarcopenia,” Nat Med, doi:1010.1038/s41591-018-0131-6, 2018. P. Arnold et al., “Peripheral muscle fatigue in hospitalised geriatric patients is associated with circulating markers of inflammation,” Exp Gerontol, 95:128–35, 2017. X. Wang et al., “A 60-min brisk walk increases insulin-stimulated glucose disposal but has no effect on hepatic and adipose tissue insulin sensitivity in older women,” J Appl Physiol, 114:1563–68, 2013. Correction (September 4): The original version of this story incorrectly stated that John Faulkner worked with Heather Carlson at the University of Michigan in the late 1980s. Rather, Bruce Carlson was Faulkner’s collaborator. In addition, the online version showed an image of smooth muscle. This has been replaced with one of skeletal muscle to more accurately reflect the content of the article. Finally, a misleading sentence about the role of satellite cells in muscle aging has been removed. Both the number and function of satellite cells likely plays a role in muscle decline. The Scientist regrets the errors. The Australian Ballet’s medical team is educating the company’s dancers about the dangers of stretching. Counter-intuitive? Willowy dancers melting over their legs, their noses to their knees, or sitting improbably in the splits to darn their pointe shoes: these are quintessential ballet images. So it may come as a surprise that Sue Mayes, the company’s principal physiotherapist, winces at the thought. In the early 2000s, Mayes and her team started focusing on the ankles and calves, common injury sites for dancers. They found that dancers prone to these injuries usually had poor calf endurance, so they introduced a program of calf rises (standing on one leg and moving between demi-pointe and a flat foot) into daily class. Strengthening the calf proved stunningly effective in reducing ankle injuries and calf tears; but that was only part of the picture. Conventional ballet wisdom has it that stretching produces long, elegant muscles, whereas strengthening makes them bulky. For the dancers, Mayes’ message – stretch less, strengthen more, don’t hang out in stretched positions – was a hard sell. It wasn’t until they saw a core group of dancers working over long periods with the team’s strengthening program, and saw they retained their balletic lines, that they were able to accept it wouldn’t make them bulge. It’s all in the way you strengthen. To build the Popeye muscle beloved of a certain kind of gym bunny, you need high load and lots of repetitions. The dancers work with both a strength model (high load, low repetitions) and an endurance model (low load, lots of repetitions). The combination gives them muscles that can support and protect their joints as they move through the extreme ranges of motion required by ballet. Before morning class, most of the company’s dancers spend some time in the gym gently strengthening all their muscles, waking them up and readying them for ballet moves. They’ll take the muscle to the extreme edge of a movement, but in a slow, controlled way, and then gradually increase the speed until the body temperature is up and the muscles feel warm and elastic. Why Do Pilates and Why Choose Body Perfect Pilates? I have been teaching Pilates for 17 years and although it has grown in popularity enormously, I still meet people who are still unfamiliar with the technique. So what is it? Pilates is a technique created by the late, great Joseph Pilates. A man considered ahead of his time because of his creation of exercises and apparatus. In Pilates you are working from your core (the centre of your body) for every exercise. Think of your pelvis as the centre of your body. Your feet are your foundations and your legs are your pillars. Your centre is where all the action happens. If your centre, for whatever reason, is not working as well as it could it will affect the remainder of your body. This can lead to compensatory patterns, your body can become misaligned and you can experience pain and/or stiffness. The cause of this can be a range of things for example, being too sedentary so parts of your body don’t get enough use, suffering a trauma from an accident/operation/injury or overuse or poor technique from a particular activity. Pilates can be categorised as fitness, you are ‘working out’ but also as post rehabilitation. Very importantly Pilates Instructors do not treat or diagnose. Your GP, physio, osteopath, chiropractor, sports therapist do this and once you have had your treatment and have been advised to do so, you can start Pilates. Pilates can act as a preventative from injuries reappearing again. So what do we do? We closely observe your movements, prescribe you exercises to improve your strength and flexibility and teach you to move efficiently. Through this you will gain greater body awareness, greater body length and control and an improved posture and body confidence. You will work hard but in a safe and controlled manner. You can come to sessions on your own or in a small group and every time you visit you will perform exercises catered to you and your needs. Start this year thinking about yourself and your body….for more details on sessions please get in touch. I love the start of a new year, it makes me stop and think about achievements, goals or aspirations I’d like to strive for, for the year ahead. These don’t have to be within the realms of fitness, although for me they mostly are simply because I like to move. They can also be things I want to do or places I want to visit or even jobs I need complete! I like to look forward and get excited about events in the calendar as well as needing a reminder to fit things in so by having my list or lists as they often are, I feel that I start the year full – not jam-packed but just enough so there is hope that the next 12 months are going to be simply great! Unless you’ve ever suffered an ankle injury, you probably haven’t given much thought to how your ankles move. What you might not realize is that nearly all lower body movements — including walking, squatting and deadlifting — require ankle mobility. Furthermore, stiff ankles can contribute to pain and injury in the knees, hips and lower back, because limited ankle mobility often results in compensation and compression in the joints above it. I’m going to discuss how to identify and address ankle mobility issues, but before we go there, it helps to know a little more about the anatomy of this area. In its simplest definition, the ankle is a hinge joint where the foot and lower leg meet. It is comprised of the lower part of the tibia and fibula, which are the two bones in the lower leg, and a bone in the foot called the talus. The muscles of the lower leg travel across the ankle and connect into the foot, allowing for the ankle to move when they contract. The primary actions of the ankle are plantar flexion and dorsiflexion. Plantar flexion occurs when pointing the foot down like a ballerina. Dorsiflexion occurs when flexing the foot up, as if you were pulling your toes towards your nose. Range of motion is up to 50 degrees for plantar flexion, and up to 20 degrees for dorsiflexion. The muscles located primarily on the back of the lower leg, which are sometimes collectively referred to as the calf, are responsible for plantar flexion. They include the gastrocnemius, soleus, plantaris, flexor hallucis longus, flexor digitorum longus, tibialis posterior, peroneus longus and peroneus brevis. The muscles located towards the front of the lower leg are the ones responsible for dorsiflexion and consist of the tibialis anterior, extensor digitorum longus, extensor hallucis longus, and peroneus tertius. It is also worth noting that the muscles of the lower leg also play a role in inversion and eversion, although these movements don’t occur in the ankle joint itself. Inversion is more commonly explained as the foot and ankle rolling out, whereas eversion is the opposite, with the foot and ankle rolling in. When ankle mobility is an issue, the ability to control or move through inversion or eversion also needs to be considered. I described plantar and dorsiflexion as pointing and flexing the foot, but when we talk about functional ankle mobility, we are usually referring to how the ankle moves when the foot is connected to or pushing off the ground. For example, plantar flexion occurs when you roll onto your toes during a calf raise. Conversely, dorsiflexion happens when you lower your heels during the downward motion (the eccentric portion) of a calf raise or when you lower into a squat. Additionally, your ankle goes through plantar and dorsiflexion every time you take a step. Ankle mobility can be limited in one or both directions. While you want to have good movement in both directions, limitations in dorsiflexion are usually the initial concern, because of its correlation with ankle and knee injuries. In a 2011 study published in the Journal of Athletic Training, researchers tested passive range of motion in dorsiflexion on 35 healthy individuals and then analyzed their knee displacement and forces through the joints after jumping off a box. They found that those who had greater dorsiflexion experienced less impact through their joints upon landing, suggesting a correlation between ankle mobility and the risk of injury . Limited ankle mobility can be caused by a number of factors including genetics and restriction in the soft tissues or bones, which should only be assessed by a medical professional. However, for many of us, ankle mobility issues stem mainly from how we use our bodies day to day. Wearing heeled shoes and primarily walking on flat, level surfaces can reduce ankle mobility particularly in dorsiflexion, because we aren’t moving our ankles through their full range of motion, which in turn creates shortness in the calf muscles. Additionally, weakness in the muscles of the lower leg can limit ankle mobility, because it is believed that the nervous systems creates, as a form of protection, a feeling of tightness around joints that it perceives unstable . To get a clinical assessment of your ankle — which is out of the scope of a fitness professional — you’ll need to consult a medical professional. However, the weight bearing lunge has been found to be a reliable way to measure dorsiflexion and in turn give you some information about the differences between your two sides as well as potential limitations that can require further investigation . To perform the weight bearing lunge, come to a kneeling position facing a wall, with your shoes off. Bring the leg that you’re testing forward with the foot parallel, keeping your big toe 3 to 5 inches away from the wall, depending on your height. From there, shift your weight forward as you try to touch your knee cap to the wall, while keeping your heel connected to the ground. You also want to be mindful that your foot doesn’t roll excessively in or turn out, both of which are ways that the body might use to compensate for limited dorsiflexion. If you can’t get your knee to the wall without compensation, then your dorsiflexion is probably restricted on that side. It is also worth noting that tight hip flexors can create the illusion of limited dorsiflexion in this test, because the back leg can stop you from leaning forward. If you feel the limitation coming primarily from the back leg, perform the same test in a standing position with the tested foot propped on a chair in front of you. Feet that simultaneously turn out and roll in (“duck feet”) when walking or squatting are often a sign of limited dorsiflexion, as they allow ankle movement while circumventing dorsiflexion, which would happen in a more neutral foot position. Heels that lift off the ground somewhat early during a squat can also indicate limited dorsiflexion. Heels that splay apart while the weight shifts to the outside of the feet (towards the baby toes) at the top of a calf raise can signal limited mobility in plantar flexion. While none of these indicators are a reason to panic, they are worth addressing. Good ankle mobility promotes better strength training technique, more power when lifting and running, and a decreased risk of pain and injury, especially as you get older. There are several ways to address ankle mobility, depending on the underlying cause of the restriction. Structural limitations including bony or more severe soft tissue restrictions may require hands-on treatment from a physical therapist or massage therapist. It is recommended that you consult a medical professional for diagnosis and treatment if you suspect an injury or are experiencing pain or swelling. If your limitations are minor and you don’t feel pain, then gentle stretching, foam rolling, mobility and strength exercises targeting the lower leg can be used to help yourself or your clients improve ankle mobility and control. If you are performing these exercises as part of a warm-up, you may want to favor foam rolling over static stretching, as the latter has been correlated with a decrease in force and power if performed prior to the activity. Researchers from Memorial University in Newfoundland, Canada compared the effects of static calf stretching and self-massaging the calf muscles with a roller on ankle mobility. They found that while both methods improved range of motion in the ankle up to 10 minutes after the intervention was performed, self-massage with a roller led to significantly greater force production relative to static stretching . From an application perspective, this suggests that you could use foam rolling as a way to temporarily increase ankle range of motion and then use ankle mobility and strength exercises to train the body to use that new range of motion during movement. Chun-Man Fong, J. Troy Blackburn, Marc F. Norcross, Melanie McGrath, and Darin A. Padua (2011) Ankle-Dorsiflexion Range of Motion and Landing Biomechanics. Journal of Athletic Training: Jan/Feb 2011, Vol. 46, No. 1, pp. 5-10. Israel Halperin, Saied Jalal Aboodarda, Duane C. Button, Lars L. Andersen, and David G. Behm (2014) Roller massager improves range of motion of plantar flexor muscles without subsequent decreases in force parameters. International Journal of Sports Physical Therapy: 2014 Feb; 9(1): 92–102. In August 2013, all-star swimmer Theo St. Francis was preparing to study mechanical engineering at MIT. One late summer afternoon, the 18-year-old was testing submersible robots in the Boston Harbor with his freshman pre-orientation group when his life took a tragic turn. Theo was able to take sips of air out of the side of his mouth until waves washed him ashore where a lifeguard spotted him. He received emergency spinal fusion surgery in Boston with his family by his side. “I still remember when [my family] entered the room and I saw the look on their faces — I knew something was really wrong,” he says. Theo had broken his C6 vertebrae and was paralyzed from the shoulders down. He spent the next three months in the hospital before being transferred to inpatient rehab, where the doctor’s gave him a bleak prognosis. As his peers began their freshman year of college, Theo began a rehab program to regain mobility at Spaulding Rehab Center at Massachusetts General Hospital. One of the treatment methods Theo has found dramatically improved his condition is Pilates. Theo says he was “blown away” when a trainer (who was once paralyzed herself) showed him a method of reconnecting the body through Pilates that worked for her. It has been just over two years since he was introduced to Pilates, and Theo has regained enough function to live independently, travel independently and stand and support himself on his own. He has even improved enough to ski, bike and return to his favorite place — the water. The now 22-year-old has already swam across Lake Tahoe on a relay team and is planning to swim the length of the Golden Gate Bridge in the future. However, despite his advances, Theo says the traditional medical system doesn’t account for his progress. “I was recently at a center where I was trying the exoskeleton and the physical therapist there did an exam on me,” he shares. “I was like, ‘This is kind of interesting, I haven’t had one of these since I was in the hospital, and that was a few years ago, we’ll just see what it’s like,’ and I kid you not, on that physical therapy exam, I hadn’t changed at all. The gap Theo sees in traditional spinal cord injury rehab has inspired him, along with his longtime trainer and now partner, Stephanie Behrendt, to launch Zebrafish Neuro, a redesigned approach to spinal cord injury rehab aimed at helping others recover from similar injuries. The two have launched a Kickstarter campaign to help in developing the second edition of their movement manual and hope to soon be able to share their work not only with Pilates teachers, but neuro-exercise therapists in specialty gyms around the world. Theo plans to continue spreading awareness about Pilates treatment in spinal cord injury when he returns to MIT this fall. Despite his setbacks, he holds an unwavering positive outlook on life and is more determined than ever. “One of the things I’ve learned from this process is how to recognize that a process is unfolding and that what I know now is not an indicator of the way things will always be,” he says. “In the beginning, there was no way for me to know that I would get to the places I have – to find Pilates, to become independent in the way that I have. Founder of Bare Pilates, wellness blogger and lover of sandy beaches, coffee and green smoothies. Bare strength is beautiful! Unless you’ve been asleep for the past 10 years, you’ve likely heard that Pilates has become the go-to exercise for athletes, dancers and celebrities looking to strengthen and tone their bodies. What you may not know is that this trendy fitness regime was originally developed by Joseph Pilates as a rehabilitation programme for wounded, bedridden army troops during World War I. You may also not be aware that Pilates, although fantastic at toning those troublesome spots, also offers many not so obvious life-enhancing benefits. It’s a well-known fact that Pilates helps strengthen your core, which is very important to note as we gear up for beach season. But the added bonus here is that a strong centre doesn’t just mean killer abs, it also leads to improved posture. This is especially important after research revealed that British office workers spend the equivalent of five years of their lives sitting at their desks. Pilates works its magic by focusing our attention on the deep core muscles in charge of supporting our spine and pelvis whilst they are in correct anatomical alignment. Anatomical what? Let me explain. When your spine and pelvis are correctly aligned, your muscles will be held at their ideal length, without tension. In other words, your shoulders will relax, your neck and head will move freely and you’ll feel less stress in your hips, legs and feet. Unfortunately, most of us slouch at our desk, carry a purse or briefcase and wear cute (but highly unsupportive) shoes, making it next to impossible for our spine and pelvis to be in perfect alignment 24/7. This is where Pilates can help. Through targeted Pilates exercises, you will develop a better understanding of where the muscles that support your spine and pelvis are located and how to strengthen them. Over time, your core will be better supported and held in better alignment. Tada! No more slouching at your desk! Ok – I can’t promise that you’ll grow three inches, but I can tell you that you will begin to look and feel taller. Pilates combines resistance training with flexibility, which helps you build leaner, less bulky muscles. Combine long muscles with better posture and you’ll naturally start to feel lengthened. The end result: when you feel taller, you look taller! When we feel stressed, our body releases the hormone cortisol, which in high doses can increase your appetite, weaken your immune system, make you tired and cause your body to store excess fat (particularly around the belly). Pilates has an incredible mood-boosting and stress-relieving super power. The deep conscious breathing combined with slow and steady exercises help to focus the mind whilst relaxing the body, thereby reducing stress. This means cortisol is ultimately lowered in the body, as is the excess fat around your stomach. Win, win! Who would have guessed that a programme developed for injured soldiers would become one of the most effective modern day fitness regimes for the body and mind? So what’s stopping you? Grab a mat and give it a go! Has Pilates improved your life? Share with us in the comments below.